Roasted Tomato Sauce is a great way to enjoy fresh tomatoes. You can easily make a vegetarian sauce that is hearty and filling. 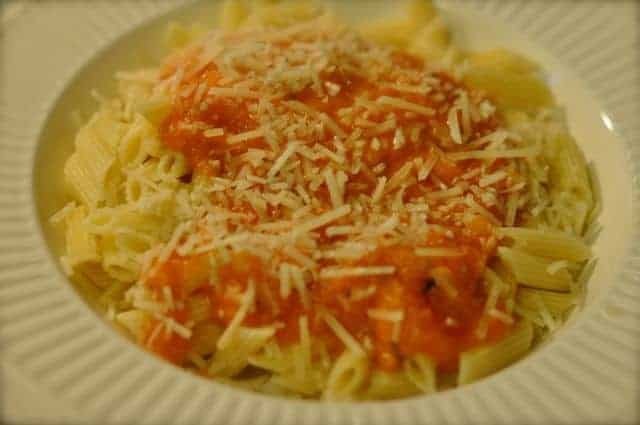 This recipe is one I adapted from Judy Heuman, she sent over a recipe on a mailing list that I am on, and I was overzealous with my tomato purchases at the co-op last week, that this pasta sauce was perfect to cure my overabundance of fresh tomatoes. Judy’s recipe was for 25 pounds of tomatoes, thankfully I didn’t purchase that many last week. I had about 3 pounds of tomatoes that were very ripe, so this was the basis for my recipe. Judy suggests that you could add things like celery, mushrooms, and more. I left this sauce very simple it was one that I easily prepared one evening after work. You can turn fresh tomatoes into a wonderful roasted tomato sauce. In a baking sheet that is at least 1 inch deep add tomatoes, onion, and garlic. Sprinkle salt and pepper over tomatoes. Add Italian seasonings to the tomatoes sprinkling evenly over the tomatoes. Drizzle tomatoes with olive oil, and then stir tomatoes to coat evenly. Bake for approximately 40 minutes or until the skins turn brown. Allow the tomatoes to cool until you can handle them comfortably, and remove skins. Drop skinned tomatoes, onions, and garlic into a blender, and puree until the sauce is at your preferred consistency. I like mine a little chunky. I simply spooned this over pasta, and then topped with a little Parmesan cheese. This was a great recipe! The sauce is so good.